Help free the ancient spirits of Ezduiin from an eternal curse. In the ruins of Ezduiin, I found an enterprising researcher working with Telenger. She's concerned about the recent appearance of the spirits. She seeks a way to lay them to rest. Use his crystal on weakened spirits. 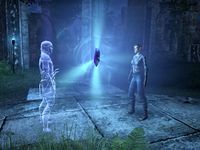 Talk to the spirit at the Ayleid vault. Solve the puzzle at the vault and collect the artifact. Sirinque gave me a magical crystal. I need to engage the spirits of Ezduiin in combat, weaken them, and then focus my will through the crystal. This should send the spirits back to Aetherius. A powerful spirit appeared and asked me to speak with him. I'm to meet with him at the entrance to a vault on the edge of the ruins. Quaronaldil Duure told me of a puzzle that protects the powerful spell lattice inside the vault. I can solve the puzzle by selecting the correct four tiles. I've chosen four tiles, I should attempt to retrieve the relic within the chest. If I'm wrong, I will need to be quick to avoid the puzzle's defenses. Now that I've retrieved the relic, I can give it [to] Sirinque. I should speak to Sirinque now that she's finished her spell. Use Persuasion on Quaronaldil to receive tip on constellations.